Damn JD Barker and damn Anson Bishop aka 4MK. OMG, JD Barker is a cruel, cruel, man, killing me with one hell of a doozy ending that has left me with a gaping mouth, so many theories running around my mind and a headache that could literally explode my brain. 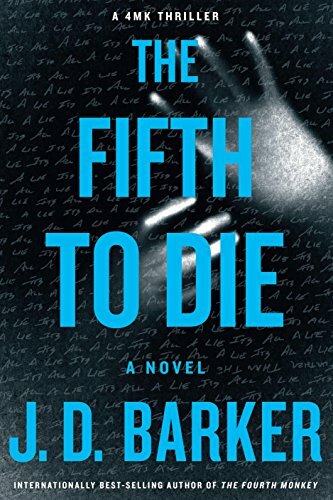 For those that follow my blog, you will know that the first book in this series, The Fourth Monkey, was one of my top reads of 2017 and JD Barker does it again with The Fifth to Die. 4MK is at it again, but it seems he has deviated from his usual modus operandi. There are startling similarities and yet some go against the grain. With children going missing at the rate of knots and then their bodies being found, either 4MK is busy or he has an accomplice. With one of their parents also submitting to an untimely death it seems 4MK is once again punishing the children for their parent’s misdemeanours but is also wreaking revenge. The lead investigator from The Fourth Monkey, Sam Porter, is once again on the case, but has this case become too personal? Sam still can’t forgive himself for Bishop’s escape and it is literally eating away at him. 4MK is extremely clever, intelligent and leaves only the clues he wants to and once again he has the police and FBI running around in never decreasing circles. 4MK is manipulative, he has no scruples and only has his own agenda, his own end game and he has them all playing, whether they are willing participants or not. This book has it all, seriously, JD Barker is a genius in manipulation, both with his words and his visceral scene setting. The twist, I HAD NO CLUE! I was simply stunned and speechless. The Fifth to Die is extremely action packed, suspenseful, intriguing, gut curdling, and one of the best psychological thrillers I have ever had the pleasure of reading. I love my crime, I love learning about serial killers, I am fascinated by this topic, I am an avid watcher of crime documentaries, CSI, Criminal Minds, you name it, I watch it, but it is often hard to portray that thrill of TV into words. Yet, JD Barker does it effortlessly. As I said in my review of The Fourth Monkey… “This author really gets into your head and plays with your mind and that is the sign of an amazing psychological thriller. The twists and turns you will never see coming, the prose utterly engaging and positively chilling, but this is a story that you will never forget and will sickly want more of.” And that still remains. I NEED the next book, like desperately!! Engaging, absorbing, compelling, intriguing, suspenseful, sick and twisted but as I said above, one unforgettable read. If you love psychological thrillers then this is the cream of the crop. Totally loved every single sick second of it.